HUGE NIGHT FOR MANTI TE’O: Manti Te’o … Manti Te’o … Manti Te’o!!! This is the stuff that dreams are made of … Manti Te’o, the Notre Dame senior linebacker and the heart and soul of the #1 ranked Fighting Irish won came up big this evening as he won not one award, not two, but three national awards for most outstanding college football player. Te’o won the Bednarik Award for the best defensive player of the year beating out defensive stand outs Jadeveon Clowney from South Carolina and Georgia’s Jarvis Jones. But that was only the beginning. Te’o had earlier won the Walter Camp Award from the Walter Camp Football Foundation, beating out Texas A&M quarterback Johnny Manziel, Kansas State quarterback Collin Klein, USC receiver Marqise Lee and Oregon running back Kenjon Barner. The Fighting Irish senior becomes only the third defensive player to win the award. However, Te’o was not done. To top the night off in style, ND’s Manti Te’o was then named the winner of the Maxwell Award, given to the college football player of the year. Te’o could not be a more deserving and humble recipient. Te’o not only has the talent, he has all of the intangibles including leadership that makes him more valuable than any stats. He has the “IT” factor. Much like with Tim Tebow, Te’o makes everyone around him better. Notre Dame linebacker Manti Te’o won the Walter Camp national player of the year award, the Maxwell Award for player of the year and the Bednarik Award, given to the nation’s most outstanding defensive player, on Thursday night. The Walter Camp award, announced by the Walter Camp Football Foundation before the College Football Awards show, is voted on by the 124 Football Bowl Subdivision head coaches and sports information directors. Te’o beat out the other Walter Camp finalists, Texas A&M quarterback Johnny Manziel, Kansas State quarterback Collin Klein, USC receiver Marqise Lee and Oregon running back Kenjon Barner. The Fighting Irish senior is the third defensive player to win and fourth Notre Dame player to be selected. Te’o also beat out Manziel and Klein for the Maxwell Award. The same three players are up for the Heisman Trophy, to be announced Saturday. 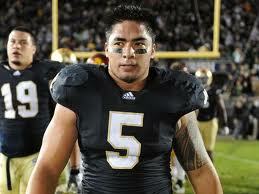 Manti Te’o has become the face of not only Notre Dame football, but this year the face of NCAA college football. Te’o did not have to come back to college this year, but he wanted to experience his senior year at Notre Dame and finish what he started. And finish he did. The Irish this year are undefeated, ranked #1 in the country and for the first time in 25 years are relevant. The Fighting Irish will be playing the Alabama Crimson Tide for the BCS Championship this year in an attempt to break the SEC streak of championships. Te’o has been the unmistakable heart, soul and inspirational leader of Notre Dame and in many respects has transcended college football and become the favored son of Notre Dame, its fans, alumni and students. His seven interceptions and key game changing tackles have only been enhanced by his humanity. As much as Te’o has given to ND, it was earlier this year during the season when the unthinkable happened and Te’o suddenly found himself in need of the love and support of ND nation. In the same week his grandmother and girlfriend died. Te’o played that weekend helping the Irish win as the ND students wore leis in solidarity and support for their beloved linebacker. Boom, Boom Boom, Let me hear you say Te’o!!! Earlier this week, Te’o picked up more hardware by winning the Lombardi Award as the nation’s top lineman or linebacker. He also won the Nagurski Award for the top defensive player and the Butkus Award as the best linebacker. It is hard to believe that after this tremendous year and all the awards won by Te’o that he is not the front-runner to win the Heisman Award. We shall see this Saturday night. Daily Commentary – Friday, September 2, 2011 – Dipstick of the Week Award!